As a person who has been home full-time for nearly seventeen years, I have developed some shortcuts in speech that pertain to the running of our home that make complete sense to me, but sometimes perplex, but mostly amuse my family. 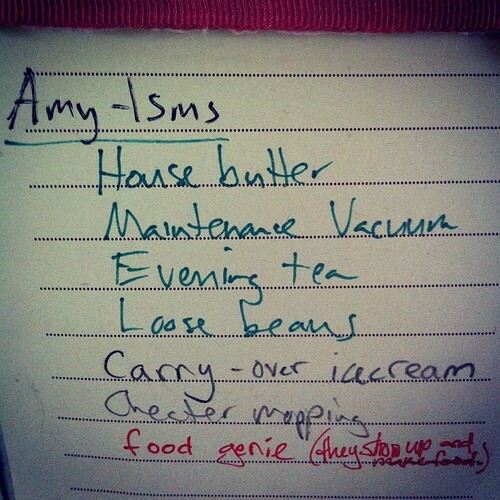 As such, Alex keeps a running list of Amy-isms on our fridge. Often these words or phrases define differences between things, that I otherwise have no words for, and I'll use my invented word or phrase and my family will snicker. It's not as if I'm the only one who has -isms, we all do, and in fact, we have begun to keep a list for each member of our family, simply because it amuses us so much. What about you, do you have -isms you'd like to share? Or do any of my -isms ring true for you, also? House Butter: the butter in the butter dish you only serve to your family and not to guests because it is full of crumbs or jam smears. Maintenance Vacuum: the simple, quick vacuuming you do that does not entail moving furniture or dusting beforehand. Not deep-cleaning vacuuming. Evening Tea: The dark, British tea we have with supper. Loose Beans: Dried beans or canned beans. Not refried or baked beans. Carry-Over Ice Cream: The ice cream you have during the daytime or afternoon that you did not have the night before for dessert. Also called Bonus Ice Cream or Daytime Ice Cream. Cheater Mopping: The mopping done in a frantic hurry or because of spills, done with a rag or mop, and often contained to the general traffic areas of the room, like in front of the kitchen sink. See also, Maintenance Vacuum. Food Genie: The genie you wish you had because you simply can not muster the creativity or energy to come up with yet another meal that day. Example sentence: "It's 630pm and we're having eggs because the Food Genie didn't show up again."